Gates open at 7:15 am and close at Sunset. Torrey Pines State Natural Reserve is located between La Jolla and Del Mar, California, north of San Diego. From Hwy 5, exit on Carmel Valley Road and drive west for about 1.5 miles till you reach the Coast Highway 101. Turn left and proceed along the beach for about a mile. The park entrance is on your right just before the highway begins to climb the Torrey Pines grade, where you can pay to park. You can also enter the park from the North Beach parking lot. From Hwy 5 going southbound, exit on Carmel Valley Road and drive west for about 1.5 miles until you reach McGonigle Road. Turn left on McGonigle Road to enter the parking lot where you can self-pay to park and walk to the reserve by walking towards the beach and going underneath the bridge to access a ramp that will lead you to a sidewalk to get to the trails at the Reserve. From Hwy 5 northbound, exit Genesee Ave and turn left. Continue on Genesee Ave, veering to the right onto N. Torrey Pines Road for approximately 4.5 miles. Turn left when you reach the bottom of the grade to enter the park. 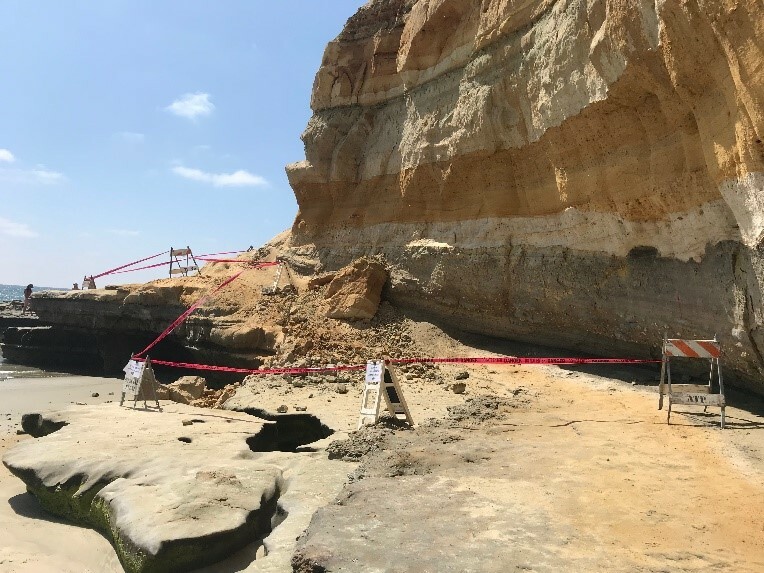 To access the north end of Torrey Pines State Beach, continue northbound on N. Torrey Pines Road until you reach Carmel Valley Road. Turn right until you reach McGonigle Road then turn right into the parking lot. To access the trails at the Extension, free public parking is allowed near the trail heads. (To make reservations for large group hikes with over 25 people, special/private hikes or weddings go to: https://torreypine.org/contact-us/special-events/). IN FALL 2018, THERE WAS A LARGE BLUFF COLLAPE AT FLAT ROCK. 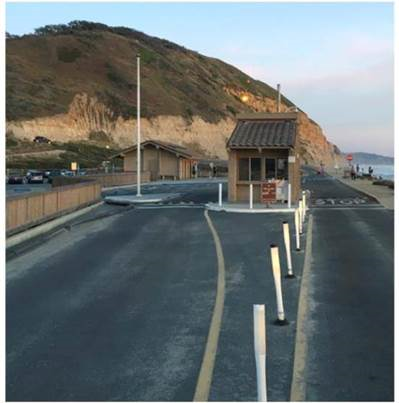 PARK STAFF HAVE PLACED BARRICADES AND WARN VISITORS NOT TO WALK AROUND THE POINT. WE ARE WORKING ON GETTING PERMANENT SIGNAGE FOR THE AREA WARNING VISITORS OF THE HAZARDS. LARGEROCKS ARE STILL FALLING AND POTENTIALLY DANGEROUS. State Natural Reserves have outstanding or unusual natural or scenic values. Torrey Pines State Natural Reserve is a wilderness island in an urban sea. This fragile environment is the home of our nation's rarest pine tree - Pinus torreyana. Once this tree covered a larger area. It now grows only here and on Santa Rosa Island off the coast near Santa Barbara. The park preserves not only the trees, but also one of the last salt marshes and waterfowl refuges in Southern California. The reserve features high broken cliffs and deep ravines on headlands overlooking the ocean. Hikers can follow trails through stands of wind-sculpted pines. A picturesque, pueblo-style structure that served as a restaurant when it was built in 1923 houses the visitor center, featuring interpretive displays. Picnicking and camping are prohibited in the reserve. The reserve's rich plant community features wildflowers in the spring and visitors can see the California quail gathered in coveys in the early mornings of fall and winter. Torrey Pines State Beach can also be reached by trail from the Reserve. Annual Passes are now sold at the entrance kiosk station operated by our concessionaire, LAZ Parking. The entrance kiosk station is open from 8:00am to approximately a 1/2 hour before sunset 365 days a year. For more park information go to Torreypine.org/reserveinfo. Are there any rattlesnake? - The answer is, "Yes!" The 2 most common rattlesnakes you will see here are the Southern Pacific Rattlesnake and the Red Diamond Rattlesnake. The Southern Pacific Rattlesnake is the one you will most likely run into in the park. 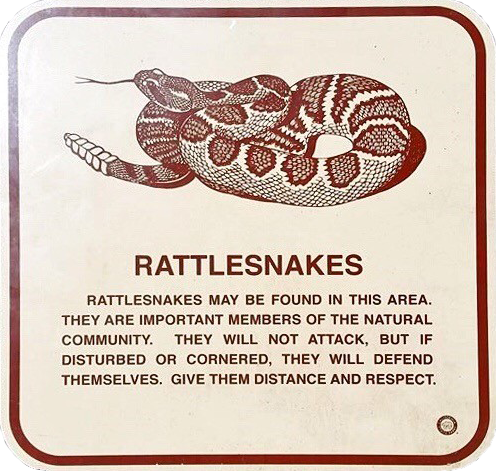 If you do see a rattlesnake while hiking, stop and wait until the snake leaves the area. It has mostly likely felt you coming from the vibrations you've made walking on the trail. If it doesn't leave, turn around and notify a park employee or volunteer. Snakes are more willing to leave you alone and find something more manageable to strike and eat (unless you try to take a selfie with it). On rare occasions, snakes do land on the beach having been pushed or fallen off the cliffs. Notify a park employee so that the snake can be returned to a more suitable location to live. Do not try to relocate or pickup the snake yourself. One of the more common complaints in the summer time at Torrey Pines is the parking. When the South Beach lot fills up, we close the entrance and visitors need to head to North Beach for parking. There is now a flashing light on the top of the kiosk to alert visitors when the gate is closed. This early alert system will enable visitors to go directly to the North Beach parking lot and avoid having to make a u-turn at the closed entrance to the South Beach lot. 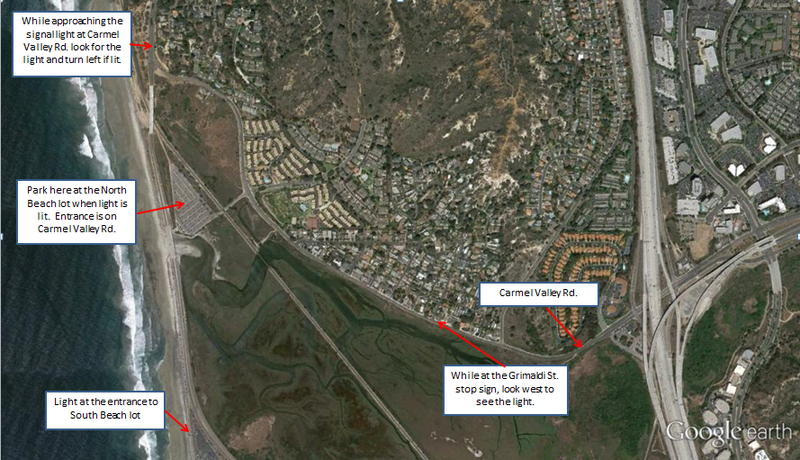 Once you know exactly where to look, you can even see the light from the top of High Bridge or Carmel Valley Rd. See map below for some locations to look for the flashing light. Torrey Pines is one of the most popular State Parks in San Diego. As a result of this, Torrey Pines becomes very crowded during the summer time. The hours between 10:00 AM - 1:00 PM tend to be the busiest hours of the reserve, so it is best to plan around these times! Docent Led Hikes: Every weekend day and nationally observed holidays at 10:00 a.m. and 2:00 p.m.
Due to extensive damage to the trail, California State Parks will be working in conjunction with the CCC (California Conservation Corps) to repair Broken Hill Trail. During this time, the section of the North Fork trail to the Beach trail wil be closed. Areas that have been washed out will be bridged and the trail surface will be leveled and repaired. These repairs are expected to last for approximately one year. 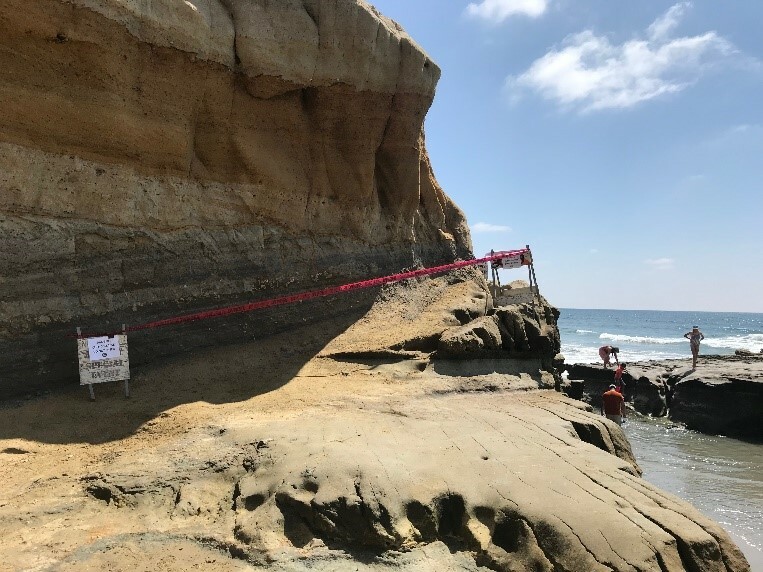 While the beach will not be accessible from these trails, the ADA upgraded South Fork trail to Broken Hill overlook will remain open. We thank you for your cooperation during this critical time. Stay on trail – Walking off trail causes erosion, tramples plants and frightens wildlife. No pets – Dogs frighten wildlife and their waste causes nesting animals to abandon their young. No food in the reserve – Help keep our animals wild and healthy by picnicking only at the beach. No drones – To Prevent possible resource damage from accidents and to avoid frightening animals. No picking/collecting natural features – Pinecones and flowers must be left to produce seeds to grow new plants. It also allows fellow visitors to enjoy the fauna. No smoking/open flames – Torrey Pines has a high fire danger. The plants found here are dry and flammable. No amplified music – Respect your fellow hikers and enjoy the sounds of nature while in the reserve. Torrey Pines State Natural Reserve preserves habitat for North America’s rarest and most geographically restricted type of pine tree species. Several natural processes interact to form the habitat for the pines. The reserve and beach are perfect places for visitors to see vestiges of past environments and their continuing influence on the landscape and to envision the dynamics of shoreline processes. Torrey Pines is one of the most popular State Parks in San Diego. As a result of this, Torrey Pines is very busy year-round. The hours between 10:00 AM – 1:00 PM tend to be the busiest hours of the reserve, so it is best to plan around these times! Mid-day, after 11 AM, during holiday periods and summer it may be difficult to get in to park at the South Lots. Consider parking in the North Beach Lot. If there is no staff person in the kiosk at the park entrance, the parking fee must be paid at the Automated Pay Machine located in the South Beach parking lot. Pay at the Automated Pay Machine located near the entrance or west end of the parking lot if no staff person is in the kiosk. Winter Weekdays: Hourly rates are available at North Beach lot. Note: Recreational vehicles longer than a standard parking spot are allowed only in the North Beach lot. Gates open at 07:15 am and close at Sunset. The Visitor Center opens daily at 9:00AM. The reserve is a day-use park only. There is no overnight camping at this facility.